What Is Tempo Riding In Cycling? Tempo rides are 76-90% of your FTP, so think of it as you can still talk to your friend next to you, and although it may be slightly labored, you can speak in short bursts of sentences. You probably need to catch your breath here and there if you are telling a story. Your brisk group ride is tempo. The crew is buzzing along, with some decent effort at the front, and you’re definitely coasting at the back. Now the group ride usually turns into a hammer fest at some point, but that is clearly not tempo. Tempo riding is often substituted for endurance riding (50-75% FTP), and this is why we are making this post. The good thing is that both physiologically develop the same things in the body, and help create a fantastic aerobic engine. Cycling is an aerobic sport, even at very short track events, so having a large base of aerobic fitness is extremely beneficial to a cyclist. The biggest difference is the fatigue that develops from tempo riding. Let’s take a deeper look at tempo riding and the body. What Does Tempo Riding Do To Your Body? Let’s take a look at this amazing chart from Training and Racing With A Power Meter. As you can see, you get more of the aerobic, endurance based adaptations, by riding tempo, and it doesn’t FEEL that much harder. Sure, you can make a case that threshold gets even more of those adaptations, but you can’t repeat it as often or ride it for as long. Would it be more realistic to ride a few hours of endurance, a couple hours of tempo, or just ONE hour of threshold (even that is a big request for many)? Threshold is just too intense to ride over and over, let alone back to back to build an aerobic engine. Here’s an updated version of this chart from FasCat Cycling, founded by Frank Overton, who really coined the term “Sweet Spot Cycling”. You can read his article on Sweet Spot training here, which is really good. While we are huge fans of sweet spot, it isn’t something that most riders practice for longer than 20 minutes. Check out our article on Sweet Spot training to see when you should use it, and how to use Sweet Spot Training To Avoid Getting Dropped From The Break. Let’s get back to the tempo conversation at hand. Why is it the Silent Killer? Why Would You Ride At Tempo Pace? If you are a believer that cycling is an endurance and aerobic sport, you would obviously want to develop that type of engine. As we mentioned above, you need to be able to do it for longer periods of time, so you can’t just ride threshold (100%) day after day. The fatigue is too high. But what if you don’t have tons of hours to train? BINGO: enter tempo riding. It’s a great way to bake the cake faster. BUT, you must remember that it is more fatiguing, and this is why it is the Silent Killer. When athletes build their fitness through the winter, the indoor riding gets boring when riding at 75% day in and day out, so they ratchet it up towards tempo; it’s more fun, but not TOO hard. They see improvements in their aerobic efforts, so they continue to do so. Everyone is hyper-obsessed with CTL (Don’t ruin your season being obsessed by it), and tempo produces a larger Training Stress Score, so the CTL climbs higher, and faster! December passes, January passes, February passes. Three months of lots of tempo riding, probably not enough rest weeks, and all of a sudden we find athletes overtrained (IN FEBRUARY!). These athletes quickly lose motivation to train, and sometimes even ride a bike, and spring is just around the corner! I realize that this sounds crazy, and that it wouldn’t happen from innocent tempo riding, but it does! Want some proof? It actually happened to Brendan when he went out to prove a point for his blog post about not ruining a season because of an obsession with CTL. If you noticed, most of that base riding was at tempo, and not just endurance. He did that in order to drive the CTL up to show that a high CTL does not equate to race readiness in cycling. What happened? He got sick (twice), created a nagging hip pain (possibly from too much intensity too soon in the year), and lost some motivation to train indoors. IT KILLED HIM! This is a rider than crushes over 10,000-13,000 miles a year, races 30+ P/1/2 and Masters 35+ evnets, and can put his body through the ringer. At the end of the block, and while writing the post, he could feel that tempo had crushed him. Now we want to be clear, tempo is a great tool, but you can overdo it. So, check out our guidelines on when you can use this to improve your cycling, and not hamper it. When Should I Ride Tempo? You get stuck riding indoors on the weekend when you have a 3-5 hour endurance ride planned. Bad weather or just no time: hit 3 x 20 minutes at 86-90% FTP, or 1 x 60 minutes if you can handle that. This is a great way to build up your ability to ride at higher intensities for longer. Instead of 150 TSS from a 3 hour ride, crank out 70-80 in an hour, or 105 TSS in 1.5 hours. It’s less than 150, but you’re short on time! Are you in the middle of a big build phase and need to keep the training stress high, but you’re getting fatigued? Assuming you rested on Monday after a big weekend of rides, and have a high intensity session on Tuesday, add a Wednesday tempo ride in at a longer duration to work on riding harder, longer. 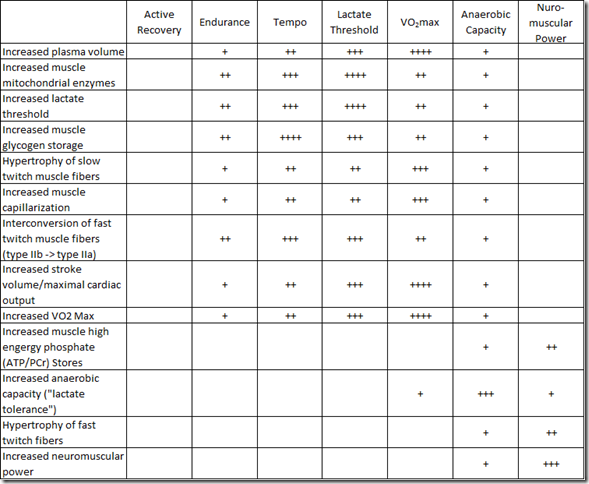 Time Crunched Athletes: Use these rides 1-2x a week along with your higher intensity rides. You’ll be able to stay close in fitness to the girls and guys that have 2-3 hours to ride at endurance, but make sure you recover hard! You’re riding at higher overall intensity and will need the rest. How Long Should My Tempo Intervals Be? Start off with manageable chunks, especially if you are new to formalized cycling training, with intervals of 10 minutes in duration. Work your way up to 3 x 15m and 4 x 20m, and then start looking to elongate these. Eventually, a couple seasons later, you may even start looking at 120 minute, continuous sessions! This may sound daunting at first, but everything builds on each other and you can do it! Tempo is super fun; we really love it, not only for the whizzing speed that you’re riding at, and the amazing adaptations that you can reap from it, but make sure that it fits into your overall plan! Make sure that you can use this tool properly to get into good form that you can build on. Don’t use it so that you are so tired that you can’t train your VO2Max system efficiently, or go out for a solid PMax session. Interested to learn more? Let’s start a conversation. Respond with your thoughts in the comments or reach out to us directly!